These are fun interactive workshops where Ann combines various metaphysical mediums, tools and techniques to assist in enhancing your own gifts. This helps one live a more authentic life. Each of these workshops includes discussion on spirituality. Interactive Workshops are held on Saturdays (see events calendar) and the cost varies. Meditation: We’ll practice different types of Meditation to include guided Meditation, open eye Meditation, symbols and music. Learning how to enhance your intuition and connection with the Spirit heightens self-awareness. Feng Shui: The primary purpose of Feng Shui is to align people with their environments in order to maximize health, abundance and happiness. Discussion is on the principles of five element Feng Shui and how to apply them to your home and office. The purpose is to create healing and nurturing environments from the elements of the natural world. Creating space with Feng Shui improves love, harmony, wealth, health, relationships and energy in your life. Tools & Techniques to Develop Your Psychic Abilities: This workshop will include guided meditation, silencing the mind, Chakra exercises, Clairvoyance discussion and exercises, communicating with Spirit Guides, how to use Tarot Cards. Vision Boards: This is an exercise that will allow you to put together what you picture life to be by using pictures, words and illustrations. We’ll discuss the secrets of manifestation and law of attraction. We will learn simple techniques to use and practice daily to bring you closer to what you desire. Face Reading: By analyzing features and markings on the face, facial diagnosis teaches how to assess and validate personality traits, past patterns and future potential as well as health problems from signs and colors on the face. We will discuss the "Three Treasures" on the face. This includes Jing - your inherited constitution or essence, Qi or life force energy and to access the emanation of Shen or spirit. Discussion includes the 5 elements of the face and what each student's primary element is and how to support it to achieve optimal health emotional, psychologically and physically. Numerology: Learn how to calculate your life path, soul's urge, heart's desire and your Life's Passion by using your birth name and date. With a chart and a worksheet you will learn to calculate a Life Map from birth to age 72. This gives you the opportunity to look at past and future patterns as well as behaviors. 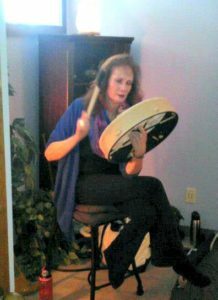 Meditation & Drum Journey Healing Workshops: During these workshops, Ann will be doing guided meditations to help ground, center and balance everyone. Ann sets a "specific intention" the day of the workshop. Through the journey participants will have the opportunity to clear the energy around this particular event, heal it and/or gain a new perspective around it. Everyone is given the opportunity to journal their experience after the Drum Journey as it is fresh in their mind. There is an open forum for sharing if participants wish and Ann will tune-in to any questions.